The Rebbe: "Your children Must be my Chassidim"
Why are you so angry? Why are you not Happy? He was one-of-a-kind. 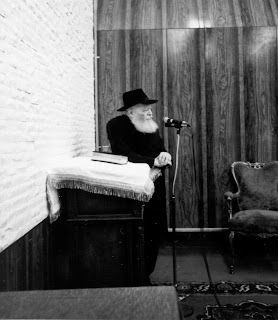 A Chassid, a shliach, and a mentor for Jews throughout the Holy Land, The following is a transcript of a unique audience Reuven Dunin, a”h, a Chabad rabbi of Haifa, had with the Rebbe in the winter of 1964. “Nu, what’s going on? Why are you so angry? What is the reason you are not Besimcha (joyful)? I told you that I wanted you to be be'simcha. If you don't do my work with happiness, then you are not fulfilling my will, and you are not performing in the same way that I am. I mumbled to the Rebbe my concerns -- concerns over money, and the source, or rather, lack of income. It was hard to be a Chassid, or at least a happy Chassid, when mundane problems stared me in the face. Nevertheless, he again stressed the role of a Chassid – to obey his leader and carry out his leader’s tasks. “When you return to Israel you should make a farbrengen for your friends, neighbors, and acquaintances,” he commanded. “Tell them about your trip here, and convey my best wishes. People will be inspired by hearing what you have learned here, if your message is properly delivered, since 'words that come from the heart enter the heart.'" The Rebbe concluded: "Your trip back should be with a joy just like the joy felt on Motzei Simchas Torah. Take good news from here and send good news from there."